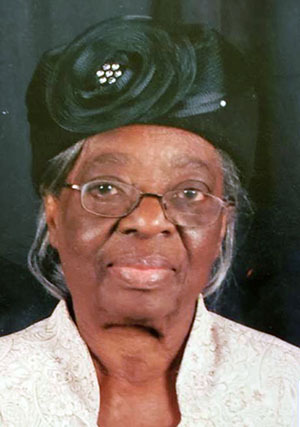 Keturah R. Townsend, 95, of New Haven, entered eternal rest on March 22, 2019. She was the widow of Mosslin I. Townsend. Mrs. Townsend was born in Sturge Town, St. Ann, Jamaica on May 16, 1923, daughter of the late George Lawrence and Dorcas Henry Lawrence. Prior to retiring, Keturah was employed at Yale University in the Environmental Services Department. She was a member of Promise Land Church of God and was previously a member of Christ Chapel New Testament Church where she served as a Deaconess, Sunday School teacher, usher and as a member of the Missionary Choir. Mrs. Townsend leaves to cherish loving memories, daughters, Beverley Townsend, Nelethia Townsend-Jones and Dorrett Townsend-Brown (Rosee); grandchildren, Dante (Ruth), Jeremy and Dijon Jones and Ivana and Timothy Brown; and a host of nieces, nephews, other relatives and friends. She was preceded in death by six brothers and sisters. A celebration of Mrs. Townsend’s life and legacy will be held Thursday, March 28, 2019, at 11:00 a.m. at Promise Land Church of God, 240 Burwell Rd., West Haven. Viewing and visitation will be held at the church from 10:00-11:00 a.m. Burial will be in Evergreen Cemetery. Townsend family while they grieve over the loss of their loved one. Only God knows your pain. My prayers are with you during this most difficult time. My deepest sympathy.